Twin-twin transfusion syndrome (TTTS) is a rare, serious condition that can occur in pregnancies when identical twins share a placenta. 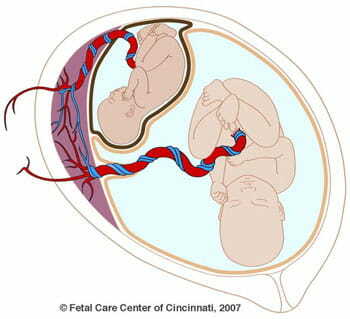 Abnormal blood vessel connections form in the placenta and allow blood to flow unevenly between the babies. One twin − called the donor – becomes dehydrated; and the other − called the recipient − develops high blood pressure and produces too much urine and over fills the amniotic sac. TTTS is a disease of the placenta, not the babies themselves, and affects each twin differently. The donor twin, who is becoming dehydrated, does not produce as much urine as it should, resulting in a low amount of amniotic fluid and poor fetal growth. The recipient twin, whose system is overwhelmed by too much fluid, produces more urine than usual. This eventually leads to an enlarged bladder and excess amniotic fluid. The excess fluid can put a strain on the recipient twin’s heart, sometimes leading to heart failure. Without treatment, this condition can be fatal for both twins. Fetal surgery is sometimes necessary to save one or both babies. The prognosis is usually better when the condition develops after 20 weeks’ gestation. Receiving a diagnosis of twin-twin transfusion syndrome is an emotional experience, and in some cases decisions about treatment must be made quickly. At the Cincinnati Fetal Center, we are here to help, providing a thorough, compassionate approach to each patient’s care. The Cincinnati Fetal Center provides evaluation, a definitive diagnosis and recommendations for treatment in a one- or two-day visit. Surgery may take place very soon afterward, sometimes within a day of the diagnosis. When patients come to the Fetal Center for an evaluation, the first step is to confirm that their symptoms are related to TTTS and not to another condition, such as diabetes or a viral infection. We use ultrasound, fetal MRI and fetal echocardiography (a detailed examination of the baby’s heart by ultrasound) to provide more information about the severity of the condition and to help us recommend a treatment plan once TTTS is confirmed. Our team uses the Quintero staging system to stage TTTS on a scale of one to five, five being the most serious. Stage IV: An abnormal fluid accumulation in more than one body cavity, also known as hydrops. This can be present in one or both twins. Using the results of the fetal echocardiography, we further categorize the severity of the baby’s heart condition as mild, moderate or severe, using the Cincinnati staging system. After the test results are available, the patient meets with members of the team, which includes a maternal-fetal medicine specialist, a surgeon and a nurse coordinator. We spend as much time with the patient in this meeting as necessary, with the goal of thoroughly explaining the test results and establishing a comprehensive treatment plan. The treatment plan we recommend depends on the severity of the condition and how advanced the pregnancy is. Referring physicians are welcome to participate in this meeting, whether in person or by phone. We provide them with detailed information about all aspects of our evaluation, treatment and follow-up recommendations. In less severe cases, surgery may not be needed. In that event, we will use ultrasound and fetal echocardiography to monitor the babies during the pregnancy. If their condition worsens, our team will work with the patient, her family and her referring physician to decide what treatment is best. Sometimes, early delivery is the best option. When babies are only mildly affected by TTTS, we may recommend amnioreduction to drain the excess amniotic fluid from the recipient twin’s sac, which may improve blood flow. If amnioreduction is not effective, patients may be given the option to proceed with selective fetoscopic laser photocoagulation (SFLP), more commonly known as laser surgery. When babies are more severely affected by TTTS, the team may recommend selective fetoscopic laser photocoagulation, or laser surgery. This procedure involves making a small incision in the mother’s abdomen and inserting a trocar, or small metal tube, into the uterus. The surgeon then passes a fetoscope (a kind of medical telescope) through the metal tube in order to see all of the blood vessel connections on the surface of the placenta shared by the twins. After all of the abnormal blood vessel connections are identified, the laser is applied to seal shut these vessels and disconnect them permanently. Afterward, the surgeon drains excess amniotic fluid through the previously placed trocar. Surgery is then complete. The location of the placenta will help determine the type of anesthesia used for the laser surgery. If the placenta is “posterior,” or located on the back wall of the uterus, we may recommend intravenous (IV) sedation and a local anesthetic. However, if the placenta is “anterior,” or located on the front wall of the uterus, we recommend intravenous sedation, a local anesthetic and possibly an epidural. After laser surgery, the majority of patients remain in the hospital for one day until their condition stabilizes. Post-operative ultrasound and fetal echocardiography are then repeated about five days after the laser surgery to reassess the fetal condition. We will work with the patients’ maternal-fetal medicine specialist and obstetrician to ensure proper follow up once they return home. Twin-twin transfusion syndrome often causes premature birth, even when treated successfully. In this case, babies require care in a neonatal intensive care unit. The majority of babies who are successfully treated for twin-twin transfusion syndrome live normal, healthy lives. However, some experience mild symptoms, such as anemia, which are easily treated. Other, more serious problems include brain lesions, neurologic deficits and heart failure. If local specialists are not available, specialists at Cincinnati Children’s can help by providing long-term, expert care for these children. Our experienced maternal and fetal care specialists offer a complete range of diagnostic tests and treatment options. Surgeons at the Cincinnati Fetal Center have performed more than 1,061* fetal surgeries for TTTS since 2004. Our center is among only a handful of centers that can offer surgical interventions for triplet pregnancies affected by this condition and for patients who have an anterior placenta. An anterior placenta is positioned toward the front of the mother’s womb, and its location increases the technical difficulty of surgery. *Data based on patients cared for by the Cincinnati Fetal Center from Feb. 1, 2004, through June 30, 2017. Our team has experience with even the most challenging surgical cases, such as those with hydrops (Stage IV TTTS) and those involving an anterior placenta. In fact, 49 percent of patients who have undergone SFLP at the center presented with an anterior placenta. Our team is experienced in treating triplet pregnancies affected by TTTS, achieving outcomes similar to those with twin pregnancies. We offer consultations for patients at any gestational age, and perform SFLP as early as 16 weeks’ gestation and up to 27 weeks’ gestation. We offer different options for anesthesia during SFLP and recommend the least invasive option whenever possible. Our center has a very low rate of surgical complications. We offer novel therapies. For example, the Fetal Center was among the first to give mothers medication to treat the recipient twin’s cardiomyopathy prior to fetal surgery. Cardiomyopathy is a disease of the heart muscle, and this drug therapy is shown to significantly improve recipient twins’ survival rates. We participate in international Stage I TTTS clinical trials to better understand this disease, refine treatment strategies and predict long-term outcomes. * Data based on patients cared for by the Cincinnati Fetal Center from Feb. 1, 2004, through June 30, 2017. * Data reflects all TTTS patients, including twins with placental insufficiency/growth restriction and patients with short cervix. ** Data based on patients treated July 1, 2011, through June 30, 2017.